Can I please spend the entire day as happy and fashionable as the little girl in this photo? Holy Hannah she’s just too much! Apparently it’s all because of Zuzii’s adorable sandals. Which, ok, I can believe it. 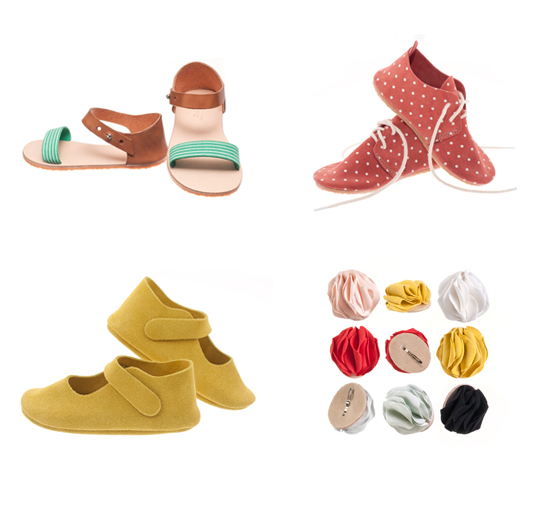 Zuzii started out making jersey knit sandals and booties, and has graduated to these beautiful leather creations. I’m so happy to see such a talented little company making big fat strides like these (all puns intended!). They still make some gorgeous accessories in jersey, but everything else is made with luxurious leathers. Considering the shoes are handmade, the prices are outstanding at $45-$55, and the styles are top of the fashion crop. I believe each pair is made to order, which is also pretty impressive. Now if they’d just increase their sizes so my girl could fit into a pair, we’d be all set! (sizes currently stop at about 36 months). Which pair are you going to grab for your littles? Hi, i just love this picture. Where did you get the skirt that is on that little girl? I don’t know, try asking Zuzii and see what they say! hi! Recently, I was eyeing the persimmon colored polka dotted oxfords ( the top picture on the right). I was wondering, are the sizes in women? I am size 6 in womens and 4 in mens. Please let me know asap. I would love to purchase them. Thank you ! Previous post: housekeeping: blog readers or newsletters?